I’m going to demystify the process of setting up a webcomics Web site. We’ll walk through all the steps you’ll need to get a basic site up and running. Then, I’m going to go through 10 ways you can make your webcomics better — right now. In other words, these are ten mistakes I see constantly in reviews, consultations and critiques. Chances are, you fall into one of the categories. The good news is that the fixes are easy, and the results are significant. 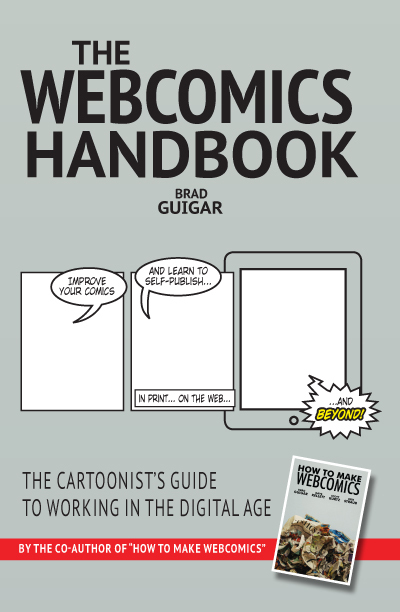 Plus, one lucky person attending the panel is going to get a free copy of my new book, The Webcomics Handbook. This sequel to How To Make Webcomics covers webcomics — art, business and beyond — from the top down. I’ll have copies for sale at my booth, #734, in the softcover AND the limited-edition hardcovers that aren’t sold in stores or online. As I’ve done in the past, I’ll take a small number of scheduled consultation sessions. This is similar to the Skype sessions that I offer. In fact, I’ll have you use the very same online form to pay for and schedule the session. You will receive a complimentary copy of The Webcomics Handbook (the limited-edition hardcover that sells for $50) when you show up for your consultation. Once you’ve signed up, I’ll get in touch and we’ll schedule the best time for you to come over for your one-on-one consultation. I usually host these sessions at my booth — since we’ll have a little elbow room there — but I’m more than happy to accommodate any special requests you might have. I’ll have a bunch of Evil Inc originals on hand as well. If you have a favorite strip, please drop me a line and let me know so I can have it available for you to look at. These originals are done with black archival ink on heavy bristol board, and the blue pencil sketch is still visible under the final art. They really do look good when people mat-and-frame them. Many an outhouse wall have been significantly spruced, I’m telling ya. If you’ve seen me at conventions, you know the deal. You can get on my commission list at the show and I’ll do a personalized piece of art just for you. $20 for a single figure (little or no background), and $40 for a completed piece. However, if you buy a book, I’ll do a headshot sketch inside the book at no charge whatsoever. Patreon has become the most significant force in comics crowdfunding since Kickstarter. Webcomics veteran Brad Guigar leads a guide to using Patreon successfully to fund your comics business.